Can I repeat the same picture from last post to say how sorry I am? I don't think so. And sorry means that you won't repeat the mistake. I have been repeating the same mistake again and again. So until I fix it on my side, I wouldn't say anything. Hopefully, all of you are good and eating well. I have been having a lot of fun and friends, work, people, relationship, and life in general have kept me busy. Cooking is something which relaxes me every day. In my always moving life, cooking is something that stays on my side. I went to Kerala for my birthday. I went home for Diwali. I also visited Chennai very recently and friends have been visiting throughout. Food is always an integral part of all my trips. These days I have a good balance of outside food and home cooked food. 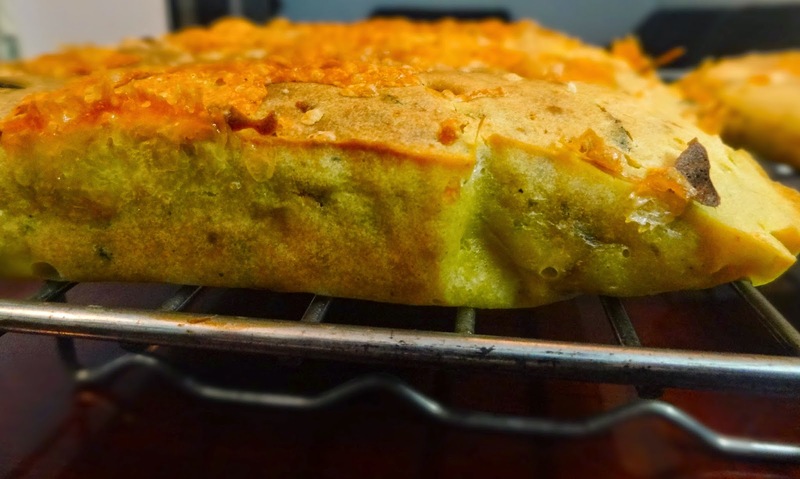 I am posting a chili cheese cornbread today. As you all know, breads are my favorite. Also, Jamie Oliver is my favorite. And this is one of his creation. I follow him on Instagram and I could not take this bread out of my mind, even when it was out of my sight. One amazing thing about this bread is that it is baked with baking powder and not yeast. So, there is no kneading effort required. There are no yeast nightmares. 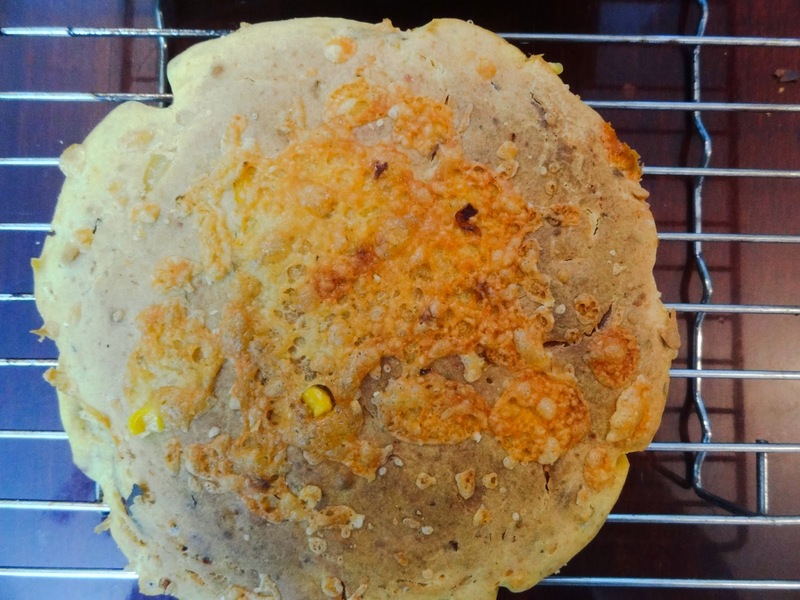 The combination of maize flour, caramelized onions, crunchy corn, chili, and cheese works amazingly well. The bread will be crunchy from outside and really spongy and soft from inside. Obviously, let's not talk about the aroma that fills the house when the bread is being baked. It is something that you need to experience on your own. I had it with salad and oh my god! Let me get started with the recipe. I have drooled enough. 1. Heat a pan, add the onion to it and let them caramelize. 2. While the onion is caramelizing, take out the corn kernels from the cob. To do this, hold the corn upright down on the plate, and run a knife from top to bottom. When the onion is caramelized, add the corn kernels to the pan. Let them cook for five minutes. Take the pan off heat. 3. Preheat the oven at 200 degree Celsius. 4. Add the beaten eggs to a bowl. 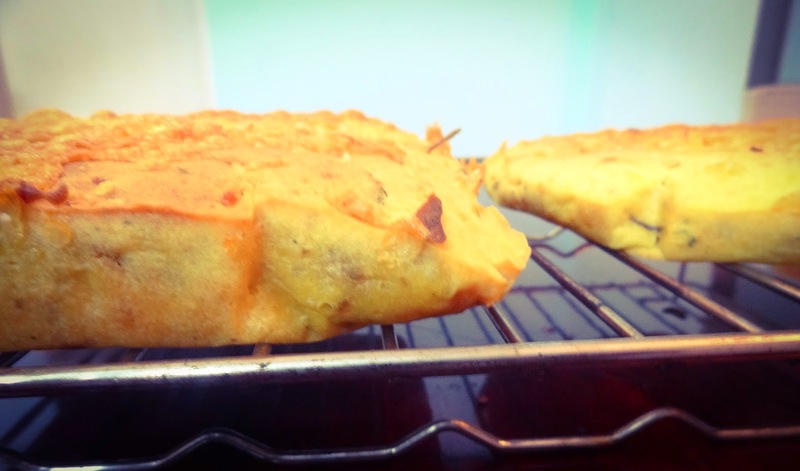 Add the maize flour, flour, salt, baking powder, a large portion of the cheese, cooled down onion & corn mixture, green chilies, and the milk to the eggs. 5. Mix the mixture properly and season with salt, black pepper and Italian seasoning. 6. Prepare a baking tin of size 22 cm or two smaller ones by greasing them with olive oil and covering them with parchment paper. 7. Pour the mixture into the baking tins, and bake for about 35 minutes. 8. After 25/30 minutes, take out the baking tins and sprinkle the rest of the cheese on the top. 9. Let the bread cool down for 15 minutes or so. 10. Serve hot with soup, salad or whatever you wish. This bread was amazing. All the ingredients were like made for each other.It is one of the easiest breads to make. Obviously, I had to make something special and write about it here. It has been so long. 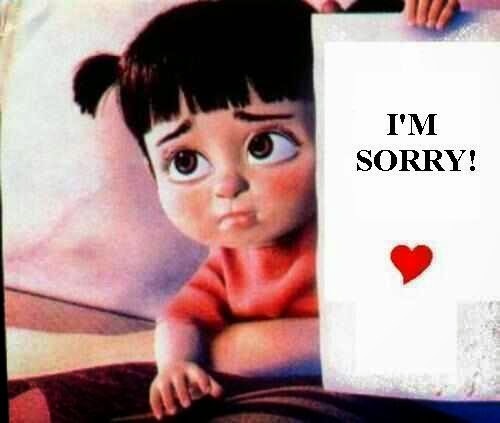 I am sorry for being away for so long. 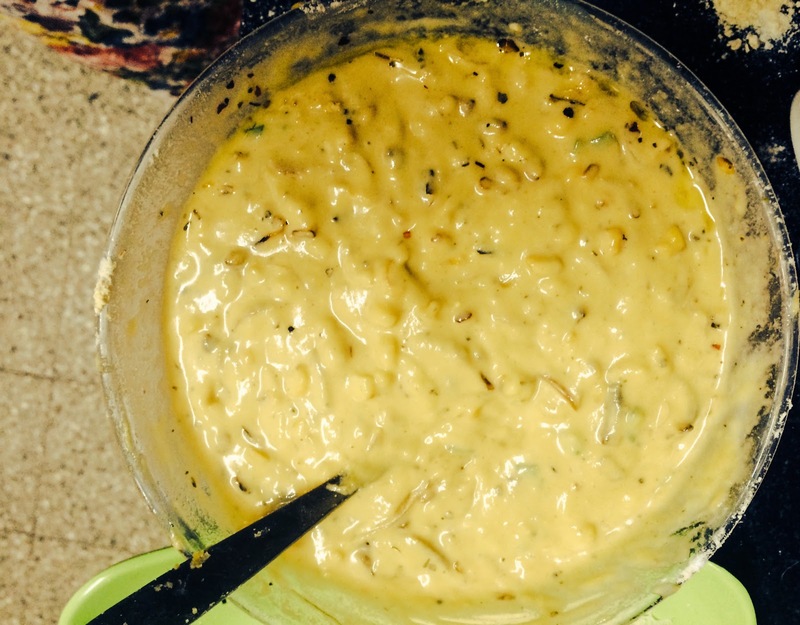 I have been cooking a lot but somehow I never got a chance to click pictures and write about it. I feel that I am missing out on something but I can not get back to it. I have been shifting cities and have taken up a job which keeps me engaged. Enough of excuses though! Let me first take you straight away to the food. I made pumpkin cake. Actually, the plan was to make pumpkin muffins but my muffin plans have never succeeded. I have baked muffins twice and they have kind of over flown and flattened out on me. I know, I know, it is hard to imagine a person having a blog and trying to preach cooking having difficulty baking muffins. So, I made 6 muffins out of the batter and when I saw their beautiful faces, I decided I would bake cake with the rest of the batter. The cake came out really well. I am a bit proud as I made changes to a Dorie Greenspan recipe successfully. We all know that she is amazing and so are her books and her recipes. I bought her book "From my home to yours" just 2-3 months back and now, whenever I have to bake something, it is the first place I peep into. I changed the recipe to make it healthier. My boy friend is on a strict and healthy diet these days and I did adjustments so that I could provoke him to eat it. I succeeded. I know I am putting all the blame on him but I myself keep searching ways to replace all purpose flour and butter in all these recipes. So far, I have been quite successful. I replace all purpose flour with whole wheat flour and butter with olive oil. It is not that simple as it sounds though. First of all, do not use these replacements when you are baking breads. Breads work with very specific ratios. Secondly, go step by step. Do not replace the complete two cups of flour with whole wheat flour, as both have different densities and different characteristic aroma and you might need to adjust the other ingredients accordingly. I replace half of the flour with whole wheat flour and same goes for butter. 1. Beat the butter and sugar together. The original recipe mentions doing this using an electric beater. I have always been using a hand beater though. I heat the sugar and butter a bit before hand to get a head start. 2. Add the eggs one by one and beat well. Add olive oil, vanilla extract and pumpkin puree. 3. Sift the flour, spices, baking powder and baking soda together. 4. Slowly add the flour to the butter and sugar mixture. Add some amount and mix well. While mixing the flour, add buttermilk and milk to keep a good consistency of the batter. The batter should neither be too thick nor too runny. You can adjust the amount of milk accordingly. 5. Add the raisins and cashews and mix well. 6. Preheat the oven to 205 degree C or 400 degree F.
7. Grease a regular size muffin pan or fit the molds with paper muffins cup. Bake for about 25 minutes or till a toothpick inserted into the muffin comes clean. 8. Cool the muffin pan for 5-10 minutes before taking out the muffins. It is a delicious cake. The pumpkin, cinnamon, nutmeg and the whole wheat flour worked out so well together. As I unwrap this amazing wonder from Laurel's kitchen, the aroma from yesterday's focaccia still hovers over my mind. The house was filled with the heavenly fragrance. Yeast was devouring its food and gluten was boasting its control. Read this article to find out how the aroma of fresh baked bread can make us kinder to strangers. Bread means something more to me. As Vikrant parsai rightly said, "If you find bread and water in the desert, you are bound to find God somewhere too". I can not agree more. And what a bread it was! So delicious, soft, flavorful and easy to make. I had it with tomato and spinach soup and it was a sumptuous meal. Then I had it again for breakfast today. I was very satisfied with the outcome of this bread. I have stumbled upon Focaccia Caprese quite a few times. Fellow bloggers post this bread often and I wanted to bake this bread for a long time now. If only, we would do what we wanted to do there and then. I know that day will come in my life. Focaccia is my favorite bread. 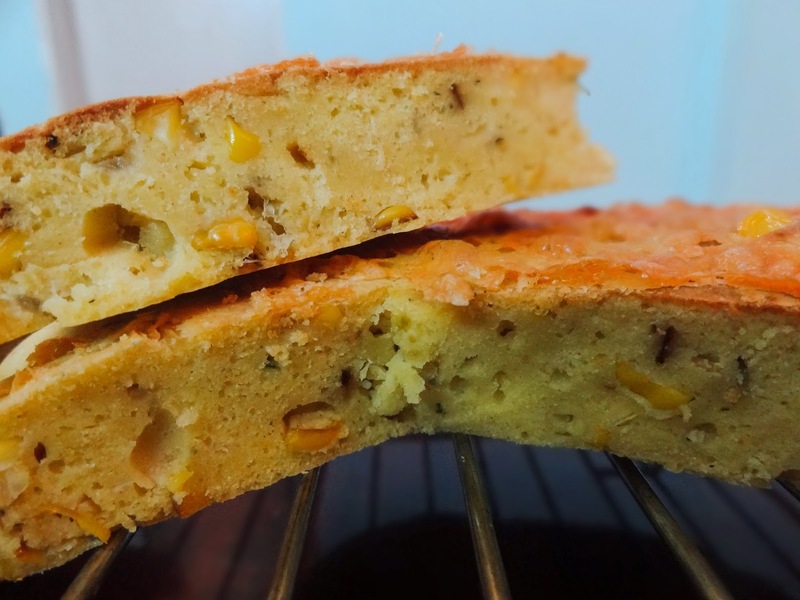 I have posted different focaccias (Masala Focaccia, Garlic and Rosemary Focaccia) before and all were delicious. I have baked them over and over again and they have never disappointed me. 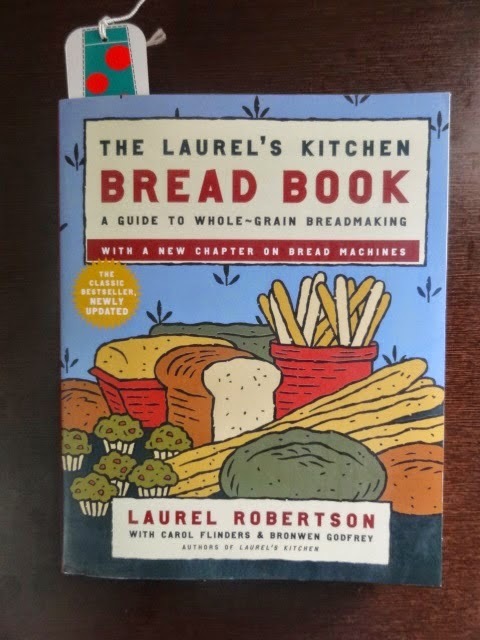 I will soon start taking deeper dives into the bread book and will bring a lot more wonderful breads to you. 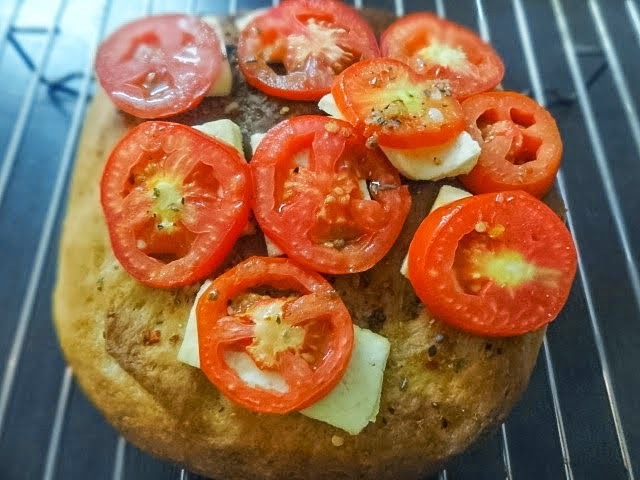 Till then, have fun with this focaccia caprese and let me know if it amazed you the way it amazed me. 1. Proof the yeast first. Dissolve a pinch of sugar in 1/2 cup of lukewarm water. Now dissolve the yeast in it. Keep this mixture aside covered with a towel for 5-7 minutes. 2. Sieve the salt, sugar and flour together. Add olive oil and yeast to the flour. Now add water slowly and keep mixing the flour meanwhile. Amount of water you need will depend on the quality of flour, humidity etc. Mix and knead the dough till the point it becomes soft, elastic and just short of being sticky. I needed about 1 1/4 cup of water. 3. Grease a bowl with olive oil and place the dough in it. Cover the bowl and let it proof for one hour. 1. Mix all the ingredients together and keep aside. 1. Preheat the oven to 210 degree Celsius. 2. Take out the dough and divide in into two parts. Take a baking try and cover it foil. Grease the foil with olive oil. Now bring the dough pieces to rectangular shapes and to a thickness of about an inch. You can shape the dough with your hand to give the bread a rustic shape. Poke the dough with fingers on regular intervals to give it a classic dimpled effect. Let it rise for 20 minutes. 3. Brush the bread with herb oil. Bake it for about 15-20 minutes or till it turn golden brown. 4. Brush the bread with herb oil again. 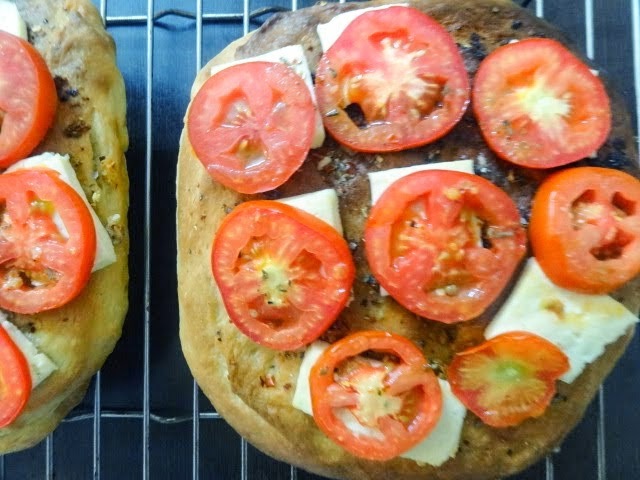 Place the cheese and tomatoes on the top. Drizzle the remaining herb oil on the top of the bread. Bake it again till the cheese starts melting or for about 5-7 minutes. A creation that inspired me through one of the social groups. I liked it instantly and got up to make it. I was also a little biased as baingan bharta has been my favorite since childhood. Whenever I saw papa bringing those big eggplants home, I would be happy. I knew it was bharta time. I would eat a lot of it and sleep merrily. Those childhood days! The concept of roasting the eggplant fascinated me. So rustic and dramatic! The aroma of the roasting eggplant would fill the house. The process of making bharta felt like a celebration to me. Though, we always made it by roasting the eggplant and frying it in onion & tomato. This time, I made it in a more rustic style. I roasted the eggplant along with garlic and green chilly. Then, I just added salt, cumin powder and coriander to it. No oil and no frying involved. It had a different taste and aroma. I had it with ghee ke haath ki roti (a variation of chapati that my mom makes and is delicious, will post the recipe soon), onion and curd. It was an amazing meal. I felt satisfied and happy that I tried it. This preparation is very healthy as it does not have any oil and is not fried. The original recipe involves the addition of sesame oil as well. I skipped the sesame oil, though I am sure that would also taste nice. Our experiences with lebanese and turkish cuisines tell us that eggplant and sesame seeds/sesame oil goes well together. It is a simple recipe. Hope you guys enjoy preparing it. Take some time out from your busy day and feel the pleasure of roasting the eggplant. The color intensifies and the eggplant releases a different aroma in the kitchen. A treat to all the senses. Be careful while buying the eggplant. Tap it to check if it sounds hollow or too tight. If it sounds hollow you are good to go else avoid it. The ones which are too tight are full of seeds and will take ages to roast. 1. Make about 5-6 slits on the eggplant. Stuff the garlic cloves and green chilies inside. 2. Roast the eggplant on open flame. Check if done by pressing the eggplant using your finger. It will take about 10-15 minutes depending on the type of eggplant. 3. Now remove the peel off the eggplant when it cools down a bit. 4. Mash the eggplant along with the garlic cloves and green chilies. 5. Mix salt, cumin powder and fresh coriander to the mash. Something worth a try! A different style of creating something you have been eating since childhood. 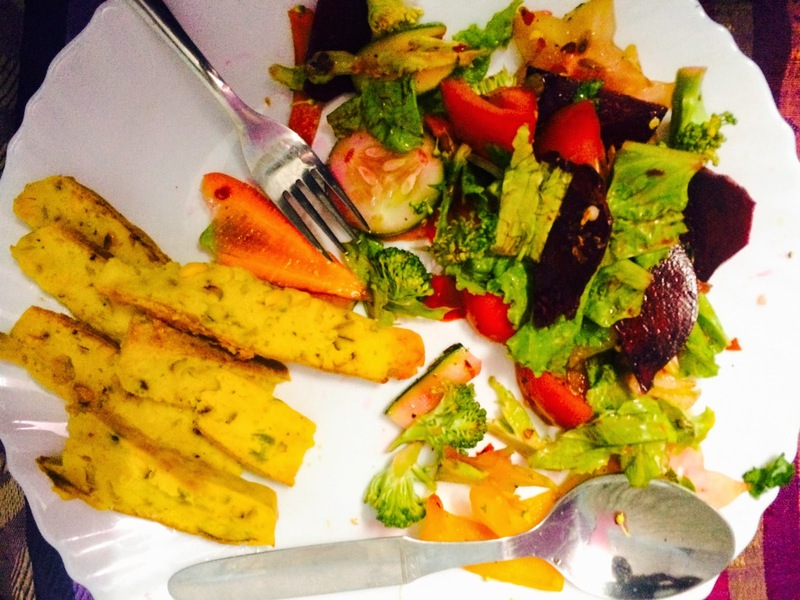 Easy, healthy, homely and comfortable food. A simple idea when implemented can turn into something amazing. Hard work and continuous persistence can make you achieve great things. Perfection is at the end of a steep and rough path. But oh my my! What a destination it is to be at! This post is again a result of an inspiration. The world of media and internet is overwhelming. You can see and share whatever you feel like. I am a part of certain groups on fb where some really inspirational stuff is shared. The world of food, is an amazing world to be in. Cooking, exploring, trying out new ingredients, trying out new cuisines, using the same ingredient differently, different styles of cooking and what not -- this is what I dream about and this is what I do. Well, I saw these potato baskets on such a group. They were empty when I saw them. I filled them up with more love and more food. The one below looks like a hat. It is funny, beautiful and delicious. I made 4 different types of stuffed potato baskets. They were amazing. My friends ate them wholeheartedly. They are a keeper. These baskets are very good for a quick bite, an evening snack or a fancy party snack. They could also be a very attractive snack for kids at their parties. This post has taken a lot from me. I had to make these baskets three times to get them perfelectly out of the muffin pan. I cracked the trick eventually. Certain pictures might confuse you and are in contradiction with the steps described below. In the steps, I describe that the stuffing has to be put in after taking out the baskets from the muffin pan and then I bake them for some more time. Though, certain pictures show the stuffing in the baskets while they were still in the muffin pan. Follow the steps and do not get confused. I tried these baskets all the possible ways and the steps describe the best possible way to make them and take them out cleanly and perfectly. If you put the stuffing in the baskets while they are still baking in the muffin pans, it will be very hard to take them out of the pan. I wanted to take a lot of pictures (as you can see). I want to improve my photography skills. Now, I am starting to settle down a bit so I also intend to buy a lot of props and a new camera, a lamp and a reflector. I hope all goes well. A lot of thought has gone into this post -- you can see the three philosophical sayings at the beginning of the post. These baskets are lovely. Stuff them up with any ingredient of your choice. Eggs went amazingly well with these baskets. The baked potato and the baked egg combination is killing. Trust me! Mushrooms and cheese also went really well. You can stuff them up with just cheese also. I think aubergine mash will also go very well with these baskets. I have not tried this combination yet. I ate a few of them without any stuffing and the taste of baked-crunchy potato was yummy. They can also be eaten with just mayonnaise. Slurp! So go ahead. Follow this recipe and let me know how it turned out. Mix the ingredients and the stuffing is ready. 1. egg (1 per basket) - Break the egg separately without destroying the yolk. 1. Mix potato, salt, black pepper, cornflour and oil properly. 2. 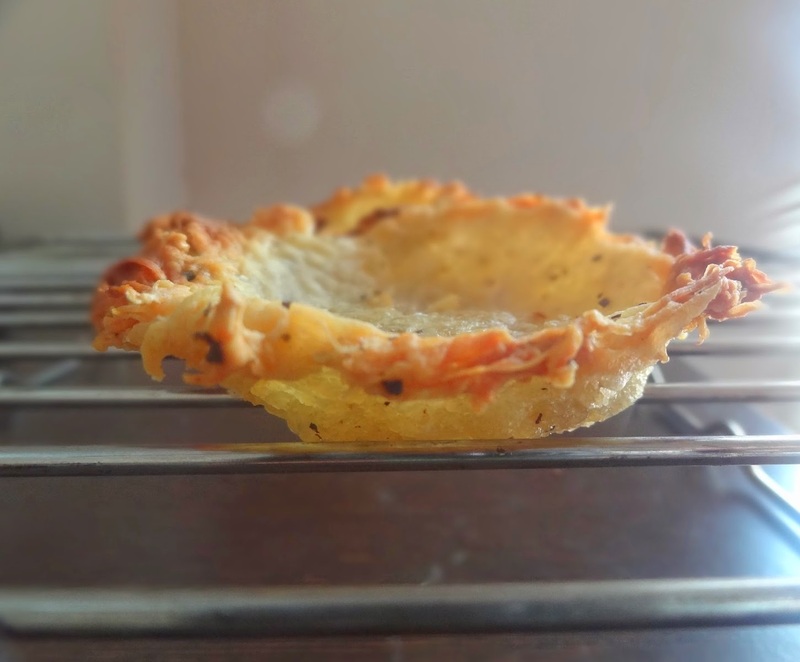 Grease a muffin pan. 3. Place the potato mixture in the muffin pan alongside the walls. 4. Bake the baskets in a preheated oven for 10-12 minutes at 200 degree celsius. Keep at the top shelf. 5. Take out the potato baskets from the muffin pan and place them on the baking tray (covered with aluminuim foil ). You have to be really careful here. Use a butter knife/rear end of a fork/knife to take out the baskets from the muffin pan. Remember to take them out before the top edges of the basket start to crisp out. As when the edges crisp out, they stick to the pan and it becomes difficult to take them out. 6. Fill out the potato baskets with different stuffing. For the egg stuffing, just place the yolk in the basket with some of the egg white. Sprinkle salt and black pepper. I also baked one of the baskets with just some egg white. 7. Bake the baskets for another 15 minutes or till you see the stuffing has become golden brown. The egg would have been baked by now. 8. Serve hot with sauce, ketchup or just some cheese shavings on top. 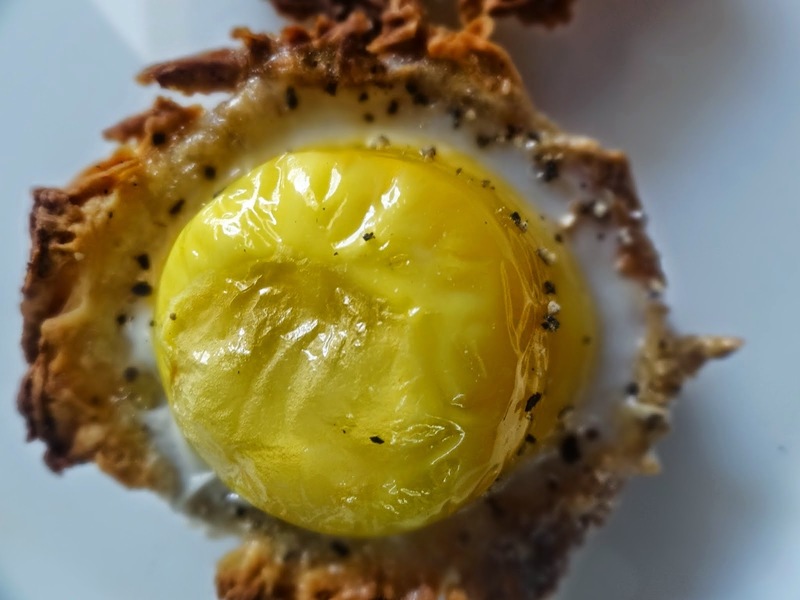 If you see closely, the baked yolk has a thin glossy film on the top. The baskets were amazing. Go try them yourself and let me know how they turned out. Disclaimer: Certain pictures might confuse you and are in contradiction with the steps described. In the steps, I describe that the stuffing has to be put in after taking out the baskets from the muffin pan and then I bake them for some more time. Though, certain pictures show the stuffing in the baskets while they were still in the muffin pan. Follow the steps and do not get confused. I tried these baskets all the possible ways and the steps describe the best possible way to make them and take them out cleanly and perfectly. If you put the stuffing in the baskets while they are still baking in the muffin pans, it will be very hard to take them out of the pan. I love calzones. I have a soft corner for Pizza and Calzone. Actually, both were part of a personal project that I was doing. That explains the extra love. I have been making calzones for months now. Though I never got a chance to post them. It is very difficult for me to list out something that I don't like to eat. Once, I and my sister were discussing about what we like and what we don't. I could not list even a single food item that I don't like. Ah wait! There was one, dry cabbage curry. My sister said that she will cook it for me and she was sure that I would like it too. She is always so confident about these things. She knows I love the Indian curries and dry vegetables that she prepares. She is an amazing cook, much better than I am. She has more experience too. I love watching her when she is cooking. And when I do, I always learn a thing or two. I make pizza quite frequently and most of the times the dough turns out to be a little extra than required. I keep it in the fridge for later use and make calzones with it. The first calzone I made, was a mushroom and onion calzone. It turned out to be amazing and I became crazy. I made all kinds of calzones thereafter. The one over which everyone drools is the chocolate calzone. I will post that soon. It is not a complex/detailed recipe but I like to create some curiosity. Chocolate calzone takes you to another world. You feel like you are flying with open wings in the clear blue sky. Summer breeze starts blowing all around and nothing seems to be better. Believe me or sue me. ;) Just Joking. I made pizza pie and pizzas on Thursday and there was some extra dough which I kept in the fridge. 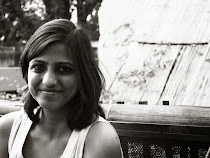 I went to Ooty with friends for the weekend. Ooty is a good place. It was sunny throughout and it was less greener. But the air was cold so the temperature was not that high. It was an amazing drive. There were a lot of memorable moments and walks. Aaah! I will never forget those. When I am up at a height, I am myself. Heights give me a high that nothing else gives (Assume we are not talking about food). Not a lot of people know that about me. But I have written poems on being at a height and enjoying the walk up to the summit. Ooty is known for homemade chocolates. We bought a lot of them. We went to Coonoor also. Coonoor is another hill station not far off from Ooty. It is known for its cheese farm. We could not go to the cheese farm and neither were we able to contact them. So, we searched for some homemade cheese in Ooty itself. We found a shop which sold local cheese. I and my friend bought a lot of cheese. The one I use in the recipe is a roasted garlic and paprika cheese. It is kind of like feta but even softer. We also bought aged cheddar, montasio style cheese, pepper honey and lemon & ginger marmalade. Shopping for food is always fun. I do it alone almost always. But this time when we entered the shop he was the one who suggested to roam around and buy a few things. I was surprised and so damn happy. It happens very rarely that I get company to roam around a food store with someone whilst the other person is also enjoying the process and is actively participating. The feeling was amazing. Our friends were busy buying clothes so we took enough advantage of the time. So now you can imagine that I had a nice weekend and have good memories. Travel and trips bring people closer. They also expose you to certain traits of people that you have been ignoring. But you realize that there are certain things which can't be ignored. Maybe they are an important part of his/her being and not yours. Well, I can keep talking about travel, trips, mountains, heights, sky, people etc. but there is a lot more that I want to share with you. Enjoy this tomato, basil, cheese calzone. Let me pour out the recipe. 1. Heat up the olive oil in a pan. Add basil to the oil when it is hot. 2. Add tomatoes and green chilly to the pan after a few seconds. 3. Saute the tomatoes on high heat for about 2 minutes. 4. Season with salt, black pepper and oregano. 5. Roll out a ball of pizza dough. Keep it thin. 6. Spread the tomato on one half of the rolled out dough. 7. Add cheese on the top of the tomatoes. 8. Apply water on the edges of this half using your fingers. This will help in binding the edges closely. 9. Close the other half of the rolled out dough over the tomatoes and cheese. 10. Bind the edges of the dough using you finger and water. Hold one end of the edges (both the layers) and give them a twist towards the inside. Keep going like this till you reach the other end. Use water if dough is sticking to your hand. 11. Take aluminium foil and sprinkle some flour on it. 12. Keep the calzone on the foil. 13. Brush the calzone with water or egg white. The top of the calzone will cook slowly now and will be crispier. The color will also be brighter. 14. Pre heat the oven at 200 degree celsius. Place the calzone in the baking tray of the pre heated oven. 15. Let it cook for about 10-12 minutes or till the point it browns up. The calzone was delicious. The crust was light and crunchy and the inside was flavorful. Really, tomato, cheese and basil is an amazing combination. I highly recommend you to make this. If the tomatoes are very juicy, some of the juices may run out. If possible, cook the tomatoes in the oven for sometime. That would take some of the moisture out. Bind the edges of the calzone tightly. I had a loose connection somewhere and the tomato juices came out. It turned out fine in the end though. So what are you waiting for? Go, go go! I saw this pie somewhere and could not stop myself from making it. Sometime back I did a lot of research on Pizzas for a personal project. I think that's when I became a much bigger fan of Pizzas. I love them. Though I am very specific about my pizza. There is no such pizza as bad pizza but I like the thin crust style the most. There has been one more change now. I usually don't order pizza, I make them at home. For dough, I have my favorite Jamie Oliver recipe which I love and am glad that I discovered it and tried it. A dear person, Cliff, shared a tomato sauce recipe with me recently, which I gladly tried and am happy that I did. This is not exactly a Chicago style deep dish pizza. This is a pizza pie. It is about one inch tall and is thin crust. I loaded it with two layers of cheese and lots of vegetables and the yummy tomato sauce. This Pizza Pie gives an instant high. It looks interesting and tastes amazing. The pie had a great crust and in the middle it was all gooey and cheesey. Pick up the pizza dough recipe from here: Vegetable Pizza with homemade dough. It makes about 3 medium and one regular size pizza. 1. Crush the tomatoes and mix with all the other ingredients in a baking pan. Check if the tomatoes taste fine. Add a tsp of sugar if tomatoes are very sour. 2. Cook for about an hour at 180 degree Celsius in the oven. Alternatively you can also cover and cook on gas until soft and all mashed up. You may use any kind of topping you like. I am putting down what I used. 1. Saute the vegetables in the olive oil for 3-4 minutes. Add mushrooms just a minute before. 2. Sprinkle the seasonings as per your taste. Do not put salt yet. Put salt just when you are about to assemble the pie as mushrooms release a lot of moisture when salt is applied. A lot of grated cheese. I used Amul Processed Cheese. You may use Mozzarella, Cheddar or any other kind. 1. Roll some dough out. It should be enough to cover a 9 inch pie pan. Roll as thin as possible. You may have your pie pan of some other size in which case you need to roll out accordingly. 2. Grease the inside of the pie pan with olive oil. Grease well so that the pizza pie does not stick. 3. Cover the pie pan with the rolled out dough. Remove the extra dough from the edges. 4. Spread cheese in the pie pan. 5. Spread vegetables on top of cheese. Garnish with salt now. 6. Now roll out some more dough. Roll as thin as possible. 8. Spread sauce on the top of this layer. You can garnish with some chilly flakes. 9. Spread another layer of cheese. Please note that all rights for the photographs and texts on this blog, unless otherwise mentioned, rests with the author. Please do not use without permission.